Welcome to the "Back-to-School" edition of the Cougar Comments Newsletter. 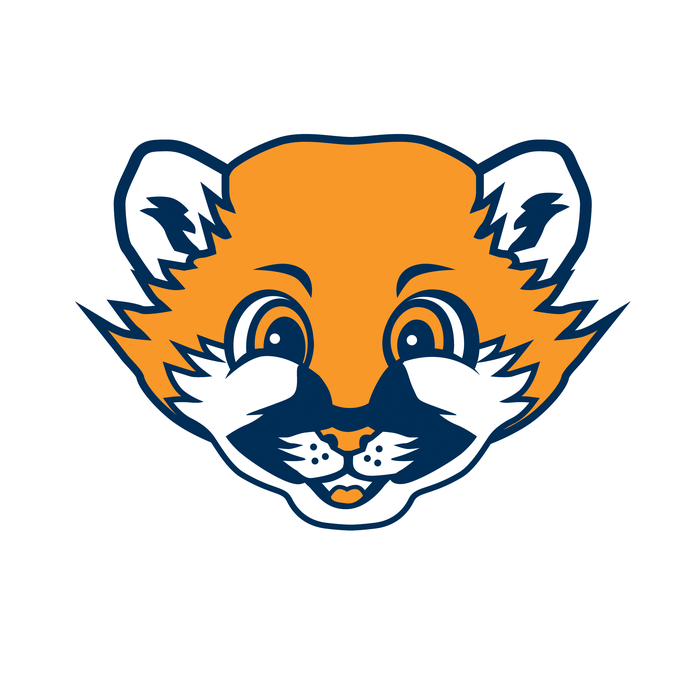 The Cougar Comments will be published weekly throughout the school year through email and social media. PTA has a section in the weekly newsletter. They do not publish their own newsletter, so please be sure to scroll to the bottom of each newsletter for PTA information. 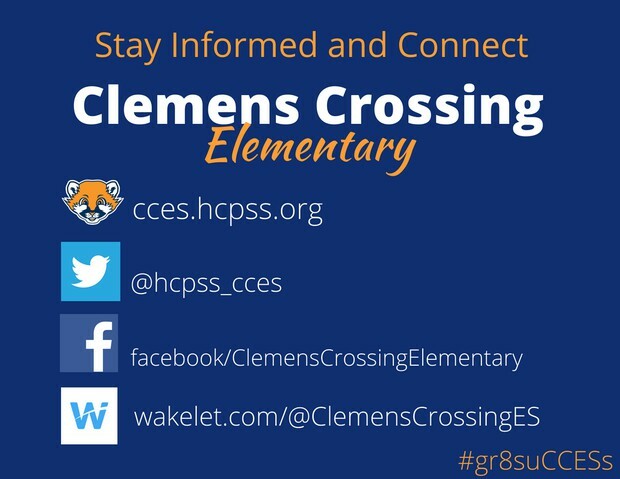 If you ever miss an edition of the newsletter or need to review a previous edition of the newsletter, all Cougar Comments will be available on the main page of the CCES website. We hope you find the information helpful. There is so much to be excited for as we begin our 40th year. The first day of school is less than a month away. Much of this information was shared during our mid-summer update. That update may not have reached our new families since the school system's move-up process just took place this past weekend. Please take the time to review the information in back-to-school newsletter. The information will help you as you plan for the upcoming school year and the first day of school. We hope you enjoy the next few weeks of summer, and we look forward to seeing you later this month. For a complete list of dates and events visit cces.hcpss.org/calendar. 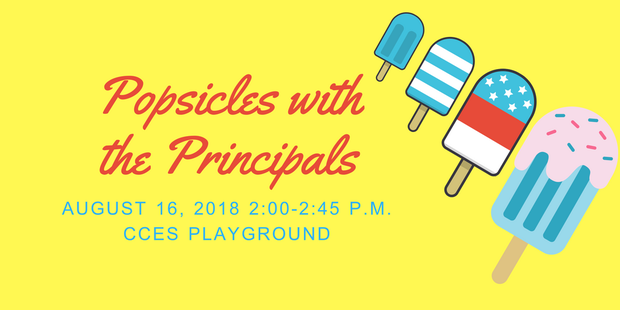 16 - Popsicles with the principals, 2:00-2:45 p.m.
30 - Open House - Kindergarten, 10:00 a.m. - 11:00 a.m.
30 - Open House - Grades 1-5, 2:30 p.m. - 3:15 p.m.
5 - Gifted & Talented Information Session, 6:00 p.m.
5 - Back-to-School Night for Grades 3, 4, & 5 at 6:30 p.m.
7 - PTA Back-to-School Family Picnic, 5:00 - 8:00 p.m.
11 - Back-to-School Night for Grades K, 1 & 2 at 6:30 p.m.
17 - PTA Kick-Off Meeting, 6:30 p.m.
To subscribe to the CCES calendar on your smartphone, electronic device, or email system use the calendar ID sqspkjkbr6v6arss44js3n21eg@group.calendar.google.com. Click to download the HCPSS calendar in a monthly format. This will be in the first day folders as well. 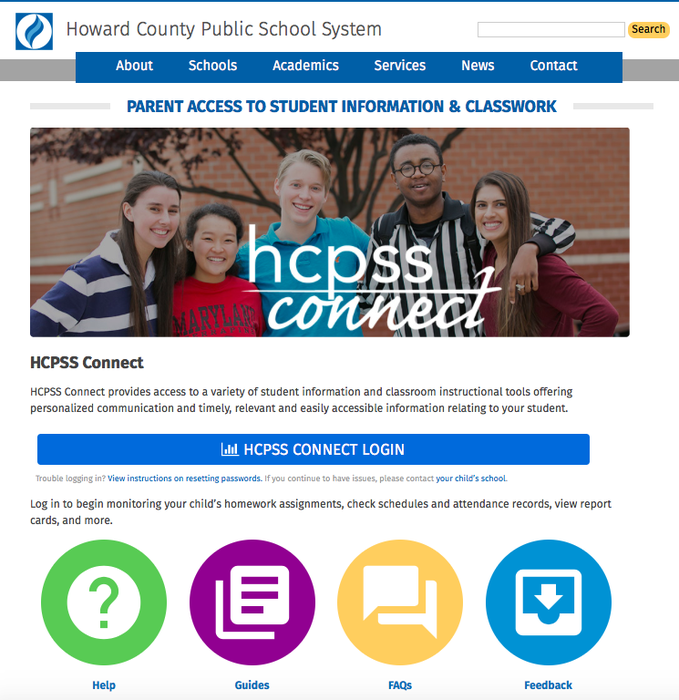 HCPSS Connect is open to update your Family File. This information is very important! Please take time to do this now. It is very important to have your Family File information complete prior to the first day of school. Parent/guardian contact information. Please provide the most current contact information. Emergency contacts. Who do you want to pick up your child in case you cannot? Arrival and dismissal procedures. How will your child arrive to school and be dismissed on a daily basis? Additionally, provide what procedure your child should follow in case of an unscheduled early closing of schools. Media coverage. This includes students being photographed for ACE awards. PTA directory. What information do you want to be included in our CCES PTA Directory? Changes of address may not be made through Family File. If you have recently moved, please contact our CCES office at 410-313-6866 as soon as possible. Parents who have forgotten their login credentials for Family File may click the “Forgot Password” link on the sign in page. If you need additional assistance, please fill out this Connect Help Form. Welcome, Mrs. Trisha Weinig! We added a fifth classroom to second grade, and Mrs. Weinig will be the fifth teacher on the second grade team. 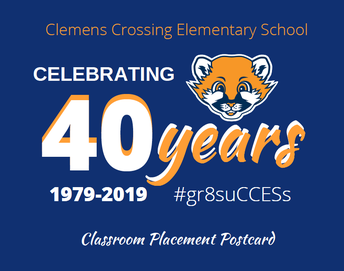 Mrs. Weinig is familiar with Clemens Crossing. She had long-term substitute jobs last year in kindergarten and fifth grade. Additionally, all three of her children have gone through CCES. Her youngest, Noah, will be a fifth grader this year. Welcome Mrs. Tammy Hampshire. Mrs. Hampshire will be our .2 technology teacher. She will be at CCES on Wednesdays throughout the school year. Class groupings is an ongoing process throughout the summer and into August. With new students registering during the summer, and some students moving out of Clemens Crossing, we have to adjust our initial class groupings. Please be on the lookout for your Classroom Placement Postcard. Postcards will be mailed no later than August 27. If, for some reason, you do not get your classroom placement postcard, you will be able to access your child's homeroom class in HCPSS Connect on August 30 at 9:00 am. The supply list for the 2018-19 school year can be found on the main page of our school's website. We encourage you to drop off your school supplies during Open House on August 30. Please be sure to clearly label your child's supplies with his/her name. All visitors to Clemens Crossing must bring a driver’s license and sign in with our LobbyGuard visitor management system. Additionally, we require a picture ID when you pick-up your child early from school. We value our volunteers and the contributions they make to our students and schools. Parents who wish to volunteer must complete a brief training course online and submit a certificate of completion to their school. This also includes anyone who chaperones a field trip. Details are available on our website. Howard County Public School System provides safe, reliable, and efficient transportation to and from school for enrolled students living beyond a one-mile walking distance from elementary school. The school & bus locator features an efficient, mobile friendly and informative format. The locator offers an enhanced map, pop-up messaging, same day updating capability, and additional school information. Type in your address to see your child’s school, bus schedule, and location of their bus stop. This information will be available with 18-19 bus information by mid-august. For the first week of school, parents are asked to ensure students arrive at bus stops earlier than the usual five minutes. We encourage parents to send their children to school on the first day the same way they would each day. HCPSS works with parents to further the safety of all children by making certain that students know the bus rules that are there to provide a safe and enjoyable bus ride for everyone. 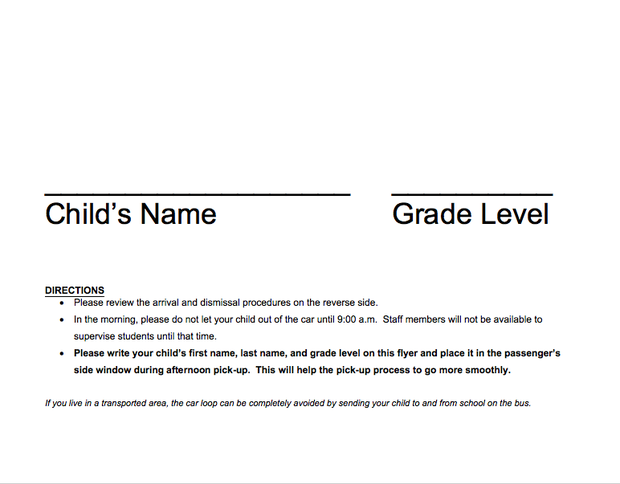 Parents ensure that students know their bus number, which is located on each side of the bus. 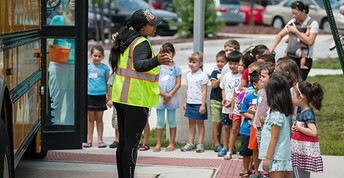 For younger children (elementary students), HCPSS recommends that parents/guardians or another trusted adult wait at the bus stop with the students to supervise their behavior and to help with any problems that may arise, such as a delayed bus or injury while waiting. Both adults and students should stand at a safe distance from the roadway. Bus stops are chosen to provide both safety and convenience for students as well as to economize on fuel and minimize the time that students spend on the bus. Parents, please do not request bus drivers to make additional stops. This puts our drivers in a difficult position, as our regulations prohibit bus drivers from making extra stops between the designated bus stops in place. Many bus routes are designed so that students do not need to cross a major roadway to use the bus. Parents should never allow their students to bypass this safety measure by walking across the street to use a different bus stop. Remind children that playing near or running toward a moving bus is dangerous. Remind children to never retrieve items that fall under the bus or next to the bus wheels. Make sure children are at the bus stop at least five minutes prior to the established pick-up time. Emphasize the need to follow the bus driver’s directions and to follow all bus rules. Help children remember landmarks that identify their bus stop. Make sure children do not have any hanging objects or materials that potentially could become caught or lodged in handrails or other tight spaces. Provide morning and afternoon supervision at bus stops, particularly for primary-aged children. I have discussed basic safety practices with my child. I have reinforced the importance of using extra caution during bad weather. I am aware of proper procedures for use of parent pick-up and drop-off area. I have made a visit to the bus stop with my child. I have checked and selected the safest and most direct route to and from the bus stop. My child is aware of the danger zone. My child is aware of where he/she needs to go when leaving the bus. I have discussed with my child what to do if she/he misses the bus. My child knows the location of his or her bus stop. Students are responsible for their behavior while on the bus and at bus stops. School buses are an extension of school. As such, students are expected to adhere to the same standards of behavior on a school bus as they do the classroom. And just like students obey teachers and instructors while at school, so also are they expected to obey the bus driver who are their instructors while on the way to and back from school. Remember, riding the school bus is a privilege for most students, but it is not a right. That privilege can and will be revoked if the student fails to observe the basic standards of conduct and safety required of them. Leave home early enough to arrive at your bus stop at least five minutes prior to the expected pick up time. Follow the instructions of the school bus driver. Keep the center aisle clear at all times. Take 10 giant steps away from the bus when getting off. Look at the bus driver and wait for the driver’s signal before crossing the road. If you drop something outside the bus, leave it. Get permission from the driver before picking it up. Never go under the bus, the driver will help you. This information is located on the HCPSS Transportation page. 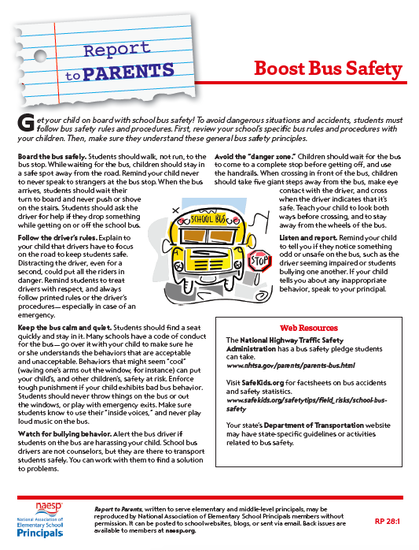 Get your child on board with school bus safety! Read the full NAESP Report. The preview is below. 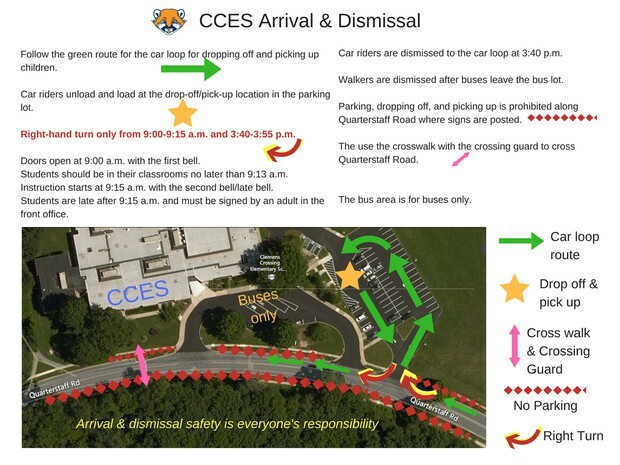 If you are in a non-transportation zone (walker or car rider) it is extremely important to familiarize yourself with our routines for arrival and dismissal. As adults, we must follow predictable patterns and routines, because children can be unpredictable. Parking in a wrong or illegal place creates unpredictable situations, and those types of situations can put students at risk during arrival and dismissal. Arrival and dismissal safety is everyone's responsibility. Please review the map below and listen to our staff members who are outside to assist your children when they enter and leave school daily. Each family in the car loop will receive a copy of these directions along with our new name tag on the reverse side in order to help facilitate a quick pick-up. Please note: Do not park along Quarterstaff Road where signs state "No Parking or Standing". Howard County Police will ticket drivers who park or drop-off/pick-up students where no parking signs are posted. Are Kids Staying Sharp During the Summer? What can children do during the summer to sharpen their skills for school? 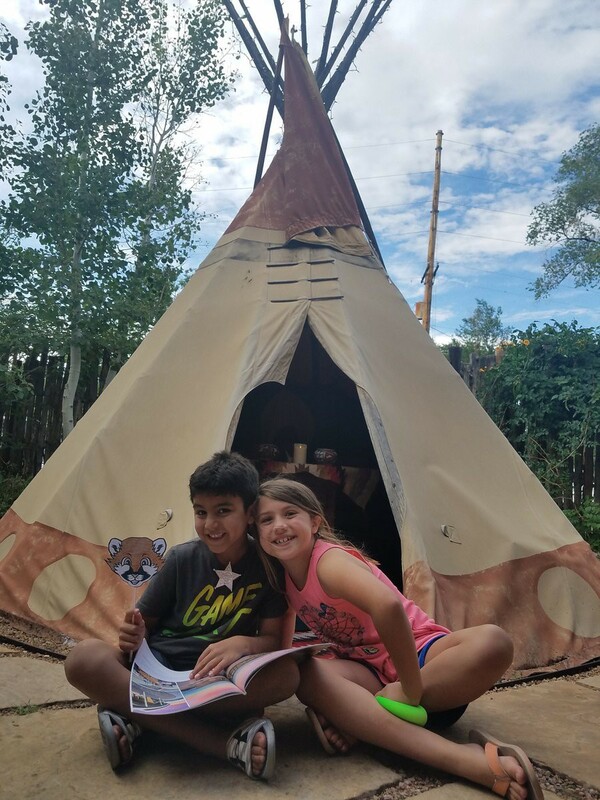 The goal is not to make the summer turn into school at home, but rather to give students a variety of opportunities to continue learning and growing while still enjoying themselves. All current CCES students will have access to their iXL account through the end of the summer. This includes fifth graders and students in kindergarten through fourth grade who are moving to new schools next year. Students returning to CCES for the 2018-19 school year will have continuous access to their iXL account without interruption. 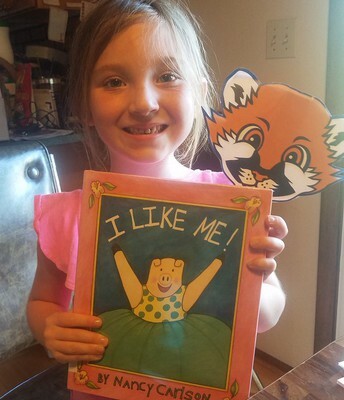 We encourage students to practice iXL Language Arts and Math throughout the summer! If you forget your iXL login information, please email Mr. Cosentino and/or Mrs. Rausch. 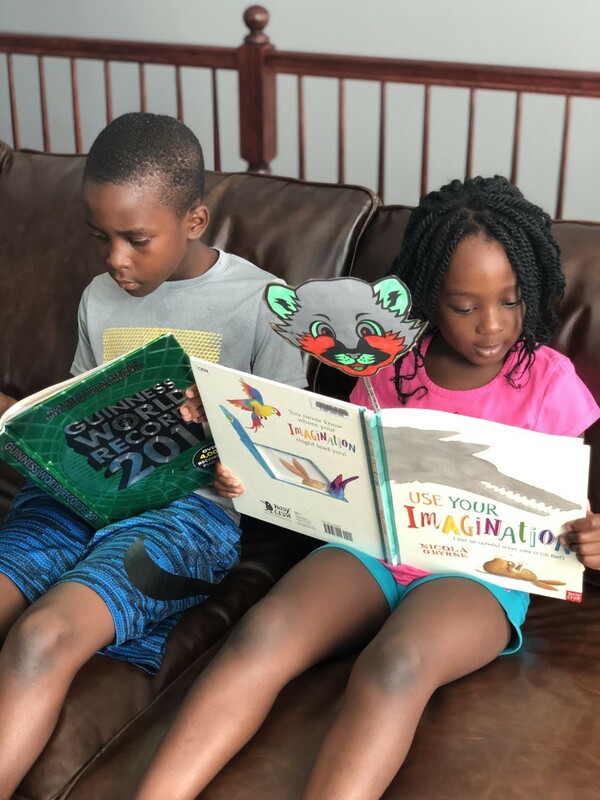 Nothing is more important than reading, and a visit to the public library is the best way to help your child find books that (s)he will like. 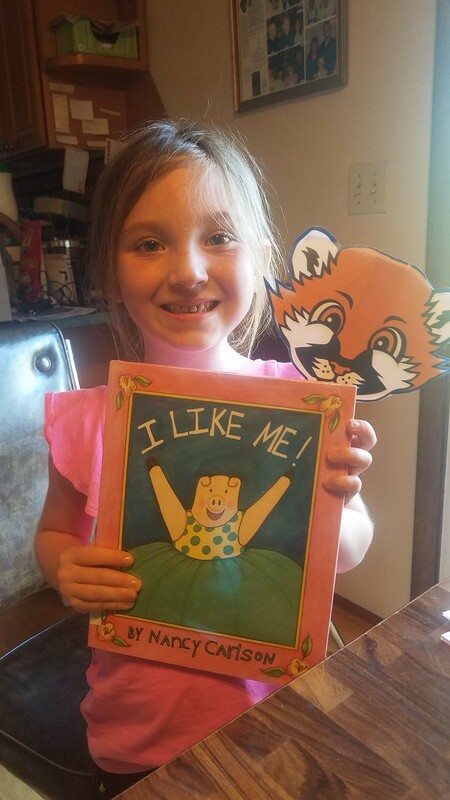 The library has books at all reading levels, including leveled books for beginning readers. The Howard County Public Library offers a wide variety of activities during the summer too. Visit the HCPL website to learn about what they have to offer. When students write, they are practicing so many skills. Encourage your child to keep a summer journal and document some of the things that happen this summer. 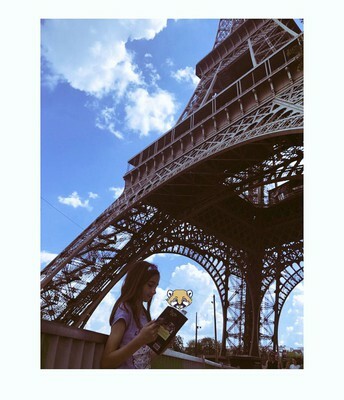 The best thing about summer is having plenty of time to read…. 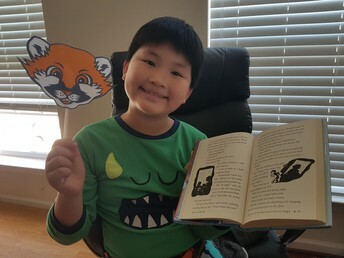 This year we are encouraging summer reading by inviting CCES students and families to take photos of themselves reading with our Clemens Crossing Cougar. 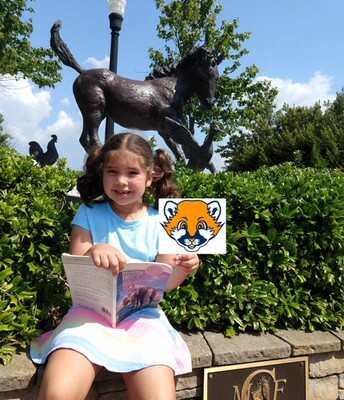 Download and print out the Cougar of your choice, then read with it and take a photo from interesting places. Photos can be emailed to Mrs. Marshall at christy_marshall@hcpss.org, so we can share them in the fall. All are welcome to participate, including fifth graders and students heading to other schools. 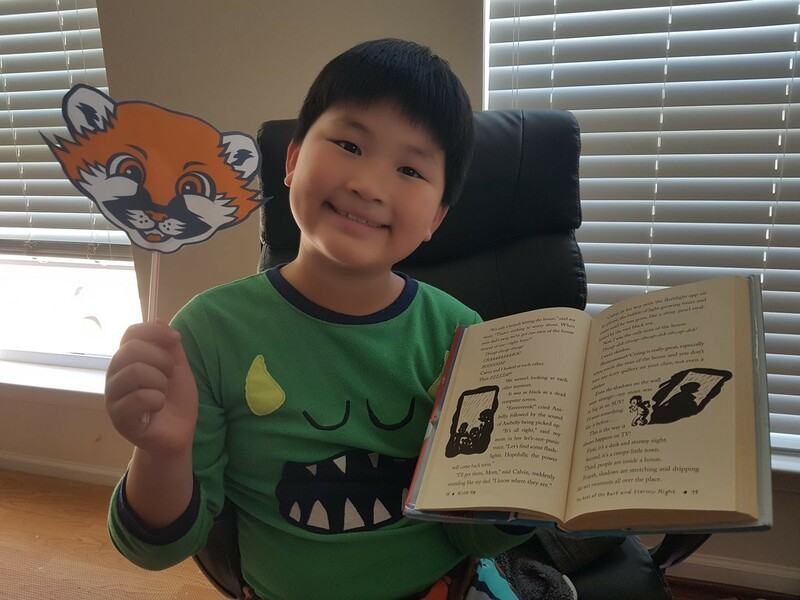 You can also Tweet your summer reading with the Cougar and include our CCES Twitter handle @hcpss_cces and the hashtag, #SummerReadingCougars. We will retweet summer reading Tweets from all over! 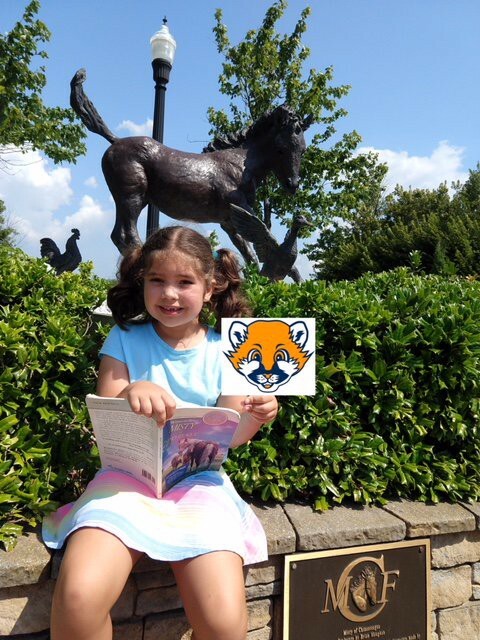 So download below, print a Cougar, grab a book, and enjoy your summer reading. Read at the pool! On vacation! In your kitchen! We can’t wait to see your photos. 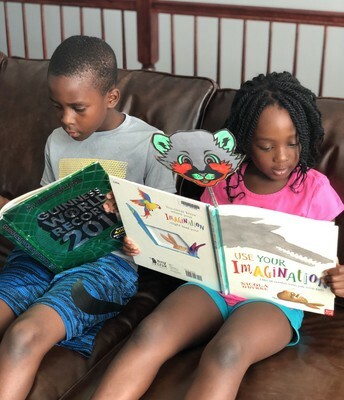 As part of the A+ Partnership with the Howard County Library System, summer reading lists developed by HCPSS library media specialists and Howard County Library System Children’s Instruction and Research staff are available for students in all grade levels. 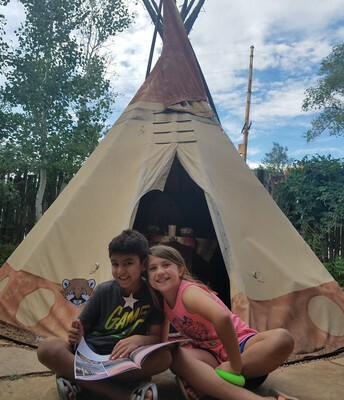 Books included are just a sampling of what students may enjoy reading during the summer. 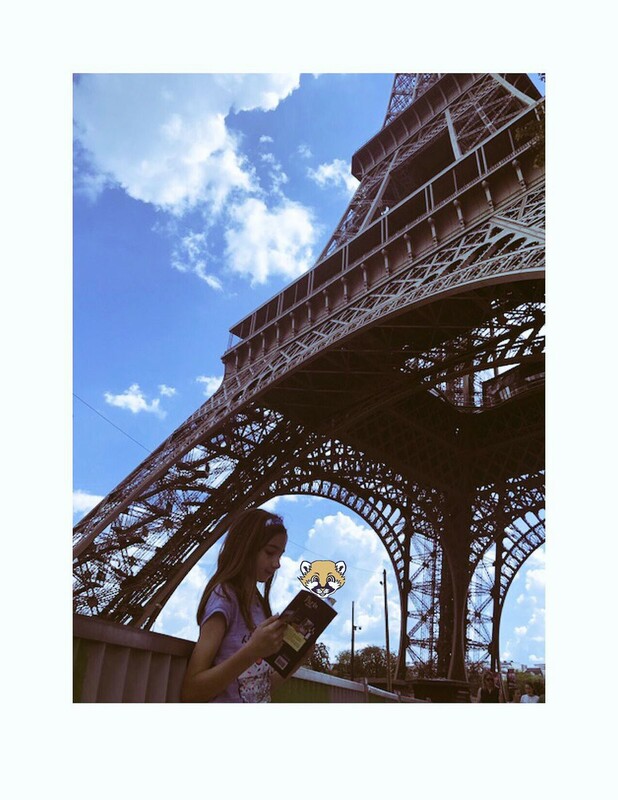 Students are encouraged to check out other books by the authors included as well as explore additional book topics at the library. Recommended lists for all grade levels are available both in schools and online. Don’t forget to sign up for the library system’s Summer Reading Club online or at your nearest branch. All HCPSS students received an A+ Student Card account number at the beginning of the 2017–2018 school year. With it, they have access to all HCLS eContent by using their account number to login via hcpss.me. Using their A+ Student Card, students can place holds and check out physical materials, as well as take advantage of all the library’s digital resources. All students have access to their school’s digital MackinVIA eBook and audiobook collection all summer long by logging in through hcpss.me with their active directory credentials. CultureGrams, which offers country reports on over 200 cultures of the world. World Book Online Reference Center, which includes encyclopedia, multimedia, e-book and primary source databases. Students can use their digital tools, available at hcpss.me, to document and celebrate their summer activities. Elementary students can use Wixie to create a summer postcard or travel journal. All students can utilize G-Suite to create a slideshow of their favorite summer day. Contact Melissa Daggett at melissa_daggett@hcpss.org with questions or for more information. This annual Howard County Library System program will help incoming kindergartners ease into school with stories and activities, including boarding a real school bus. Registration is required. Each session lasts one hour. Check the HCLS website to register and for additional details. 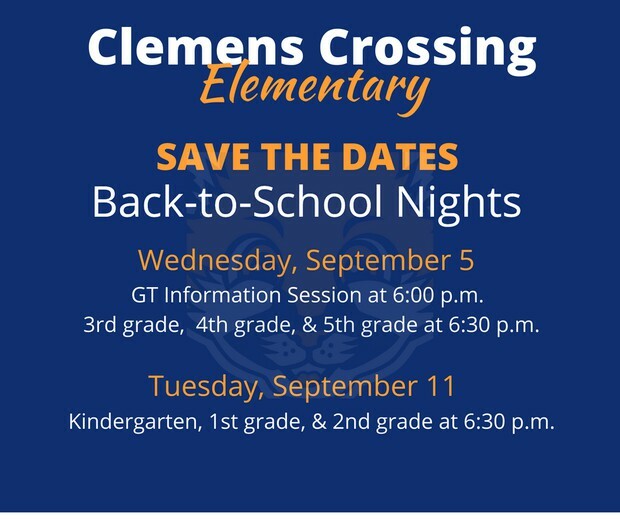 Listed below are the many ways to stay informed at Clemens Crossing Elementary School. We use Twitter to inform, celebrate, and engage our community. Twitter is used to share what is going on in our school, our community, and throughout the Howard County Public School System. Turn on notifications to get information the second it is tweeted. We live-stream our concerts on Periscope through Twitter. We have found that Facebook is the social media most used by our parents so we are now on Facebook, too! Our Facebook page is updated automatically from our Twitter feed. Please use Facebook to share the good news from CCES with your friends and families. Our website, cces.hcpss.org, is updated regularly. 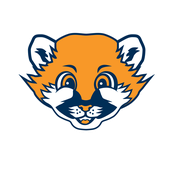 Important news and information is located on the main page of the site including an archive of our weekly newsletter, Cougar Comments. Staff information and email is located under the "Our Staff" tab. A subscribable google calendar is located on the "Calendar" tab. Email is our main form of communication. You will receive news and information automatically to the email address you provide in your Family File. We will not inundate your inbox with email. Look for the weekly Cougar Comments on Friday mornings. If you would like email sent to different email addresses, update your email in Family File with the email address you prefer. Weekly announcements, important information and updates, and more will primarily be sent through email. You also have the opportunity to opt-in for text messaging. Wakelet is a storyboard that pulls together social media content into one story. If you do not want to be on Twitter or Facebook, you can still see the content from those social media platforms at wakelet.com/@ClemensCrossingES. We will send storyboards through email periodically. Mr. Cosentino and Mrs. Hurd are hosting a get together on August 16 so our community can meet our new assistant principal, Mrs. Sonia Hurd. Please save the dates for our annual back-to-school nights. Click to download the HCPSS Student Handbook. The handbook is also available in Spanish, Korean, and Chineese. 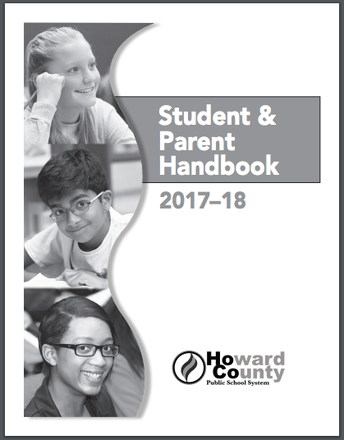 Families will receive a paper copy of the 2018-2019 HCPSS Student and Parent Handbook which is available online. Our Food and Nutrition Services web page has a lot of information parents/guardians may find helpful, including meal prices, how to pay for meals, where to view menus, nutritional and allergen information, and more. Parents of students who qualify for Free and Reduced Meals must submit a new application every school year. Details on the HCPSS FARMs program is online, including how to apply. At Clemens Crossing, we serve breakfast each morning from 9:00 am to 9:20 am. Students who wish to purchase breakfast simply need to go to the cafeteria when they arrive in the morning. Lunches are scheduled between 11:05 am and 1:35 pm. To view the menus for breakfast and lunch at Clemens Crossing, please visit the Nutrislice website on the Food Servies page on the HCPSS website. There is also a Nutrisclice app you can download from iOS and Android platforms. If you have any questions about Food Services at Clemens Crossing, please feel free to contact our Cafeteria Manager, Ms. Kelly Turner. I hope you are having a wonderful summer vacation! 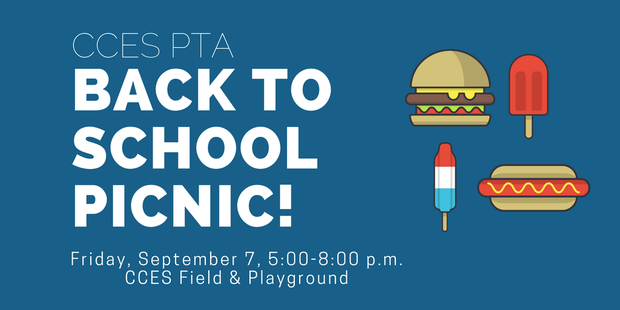 When we go back to school, the PTA helps the school feel like home by having many community-building events planned throughout the school year. We hope to see you at all of our school events this year! The PTA has several open positions for the upcoming year. New Families, younger families, even older and wiser families – don’t be shy – please volunteer! If you are interested in helping out in any way, on any level, please email me at nerakpang@gmail.com. We understand that people are able to be involved at different levels and appreciate any support you can provide – big or small. Please don’t hesitate to reach out to me with questions or suggestions throughout the year. I would love to hear from you! 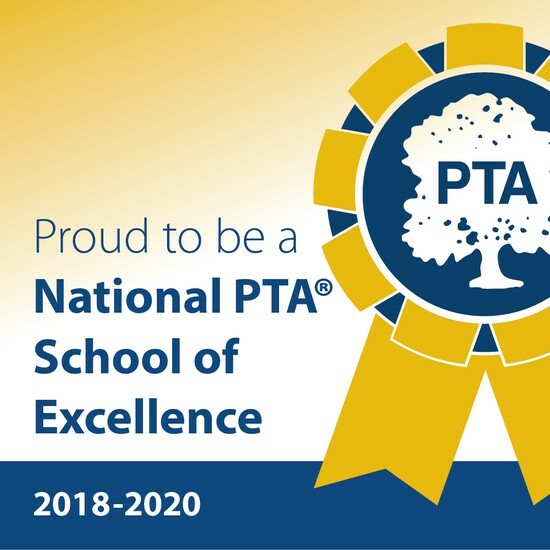 Clemens Crossing Elementary was recently recognized as a National PTA School of Excellence for the 2018-2020 school years. National PTA’s School of Excellence program supports and celebrates partnerships between PTAs and schools that work to improve the educational experience and school environment for every child. This program provides guidance to assist school in engaging families in the school decision-making and helps school build inclusive policies related to education, health, safety or the arts. 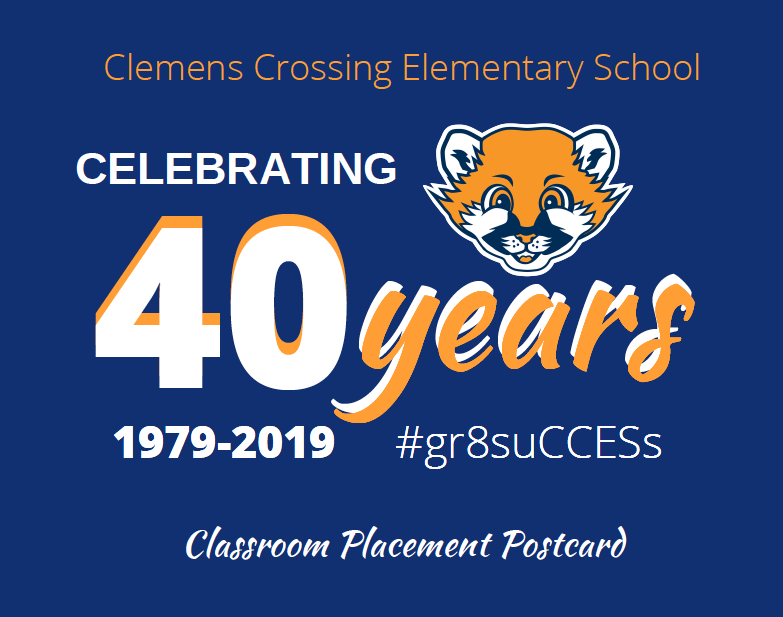 This year, Clemens Crossing Elementary made progress on providing the community with resources for health and wellness. As a National PTA School of Excellence, families feel welcomed and empowered to support student success, and PTA is a key partner for continuous school improvement. If you were planning to bring some extra supplies for your teachers at the Open House -- tissues, post-its, etc. -- please consider bringing some for the Related Arts teachers (art, media, music, P.E., technology), too. The PTA will have a collection box in the lobby for classroom supplies for specials teachers. 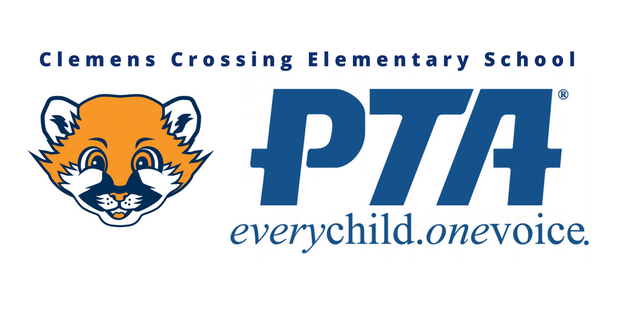 The Clemens Crossing PTA needs your help! The PTA is looking for volunteers to fill several open positions for the 2018-2019 school year. Many committees are short-term commitments (planning one event) and several can be done on your own time, without having to come to regular meetings or events. In fact, many positions are filled by several people who work as a team to plan the event. We warmly welcome all who may be interested -- it can be lots of fun to be more involved! Currently, the PTA is looking for volunteers for the positions/events described below. Bingo Night – Coordinates Bingo night in the fall -- organizes volunteers and staff member mystery callers, purchases refreshments and prizes. Bulletin Board - Designs, decorates and updates the PTA Bulletin Board in the front lobby of the school. CAC Representative - The CAC is the Community Advisory Council to the Board of Education of Howard County. The CAC meets one evening a month and facilitates communication between the Board and the community on issues of concern and matters involving education. The CAC Representative is a liaison between the CCES PTA and the Board of Education. Career Day - Supports the guidance counselor during Career Day for grades 3 to 5. Needs to be on-site for the entire career day (8:15 am to 2:00 pm). Guidance counselor recruits speakers and develops the schedule for the day. Committee chairperson organizes volunteers for the day, orders and sets up breakfast and lunch for the speakers, helps volunteers check in speakers and direct them to the appropriate classroom, and cleans up at the conclusion of the event. Communications - Oversees communication of PTA information to parents, teachers, and community including creating/editing PTA new for Cougar Comments, helping update PTA bulletin board, coordinating the management of content with Website and Social Media chairs. Creativity and writing skills are great skills for this position. Diversity - In collaboration with school staff, maintains the showcase at the entrance of the school with displays for National Hispanic-Latino Heritage Month (Sept), National Indian Heritage Month (Nov), Black History Month (Feb), National Women's History Month (March), Arab American Heritage Month (Apr), and Asian Pacific American Heritage Month (May). Creates opportunities to involve and support the diverse international backgrounds and religions in our CCES community. JA in a Day - Assists the assistant principal in organizing and finding volunteers for the JA in a Day program at school. Newcomers - Coordinates the Family Mentoring Program: identifies volunteers at each grade level who would be willing to host playdates and answer questions for new families joining our CCES Community. Parent Partners - Recruits parent volunteers who are available during the school day to work with individual students once a week throughout the year. Work closely with the assistant principal to set up volunteer schedule at the start of the year. Serve as a liaison between CCES and parent volunteers as needed. Play Coordinator - The play coordinator serves as a liaison between the School House Theater Arts and parents. The coordinator works together with STA in arranging the school play, serving as the liaison between parents and STA, and coordinating the cast party on the final night of the performance. Policy - Advises the PTA on policies and legal issues and facilitates bylaw update process (bylaws are updated every three years). Spring Carnival - Coordinates annual school carnival which includes securing food/entertainment vendors, purchasing prizes, coordinating games and mobilizing volunteers (parents and local high school students) to run the games. Talent Show - Organizes school talent show including creating and distributing flier, overseeing auditions, creating the program schedule, advertising event to CCES community, and overseeing activities on event night. Greetings! I hope everyone is having a wonderful summer! 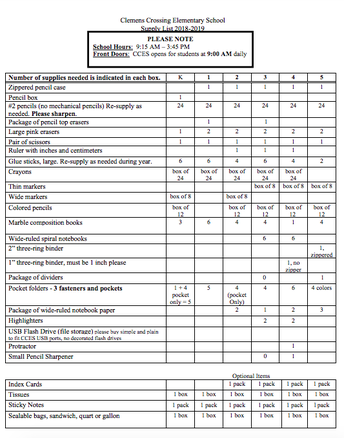 We are already planning for the assembly of first-day folders and are in need of volunteers to help! For those new to the school, PTA volunteers fill the folders with forms and other important information that your child will bring home on the first day of school. We’ll be assembling folders on Wednesday, August 29th, in the school cafeteria. The more volunteers we have, the faster we finish. Kids are welcome to attend this event and we will have a movie for them to watch and some snacks. Middle and high school children can also help and can receive credit for community service hours. If you are able to volunteer, please RSVP by sending an email to Joy Spies at joyspies@yahoo.com. Friday, September 7 from 5:00 to 8:00 pm on the school grounds. We will have playground games for the kids. You can pack a picnic dinner or buy food from our food vendors. This fun event is for both families and staff. Clemens Crossing Elementary School Media Center. Please come and share your knowledge and ideas! Did you know you can subscribe to CCES's Calendar and see events on your computer and/or smartphone? Why subscribe to the calendar? You will have all of CCES's events embedded in your calendar. If events change, the calendar will be updated immediately. The calendar ID is: sqspkjkbr6v6arss44js3n21eg@group.calendar.google.com. There are many "how to" tutorials online you can view to learn how to properly sync your calendar. It depends on your email provider, computer platform, and brand of smartphone.